This month’s Go Ahead Honey, It’s Gluten Free theme is breakfast in bed. Honestly, I don’t think I’ve ever had breakfast in bed. That’s not the kind of girl I am. I’m the get up and run five miles before breakfast kind of girl. On my laziest of days, I’m a get up and curl up on the couch with the Sunday paper kind of girl. Breakfast in bed? It’s just not appealing. But, if I WAS a breakfast in bed kind of girl, I’d imagine I’d want someone to be a kitchen slave for me – to make something I don’t particularly enjoy making myself – like, for instance, waffles. I’ve never really been big on waffles, either. My dad was the weekend breakfast chef in our house, and pancakes and waffles were in heavy rotation. I always voted for pancakes; my sister always voted for waffles. Somehow, I ended up with a kid that votes for waffles, too. How’d that happen? Anyway, since going gluten free, I’ve been working on a waffle recipe to appease the ever hungry kiddo. I set up a few rules for myself. Obviously, it needed to be gluten free. But, I also wanted it to be vegan. One of the things I’ve always hated about making waffles is whipping the egg whites and folding them. Meh. Not my thing. I also wanted it to be without starches or gums. Pancakes don’t need them, so why should waffles, I reasoned. And, I wanted it to be full of fiber and good for the growing boy. I’ve been working on this recipe very Wednesday morning for the last couple of months. And, finally, I think I have something worth sharing. The kiddo said to me this morning, “Mom – this is your best batch yet.” Whew. Pulse until almonds, oats and nuts are finely ground. Add the dry ingredients to the whisked wet ingredients. Oil your preheated waffle iron generously. (These stick if you skip this step.) 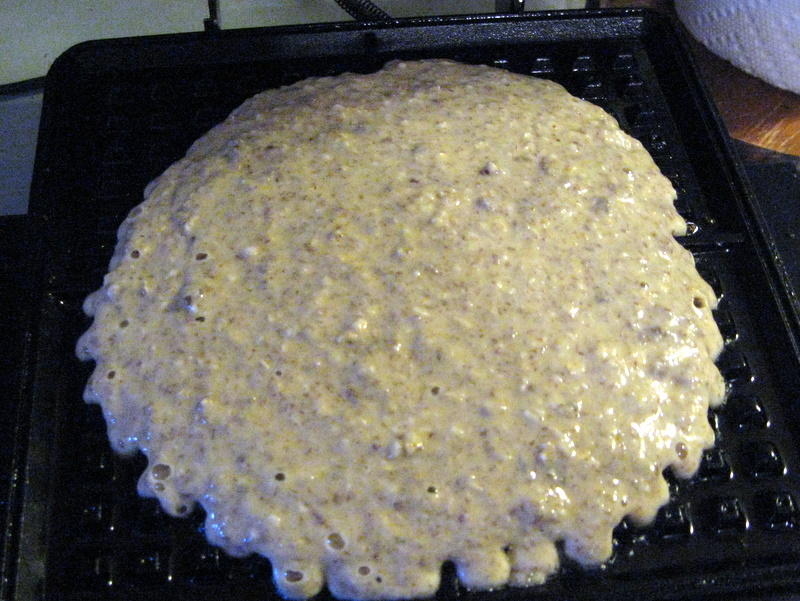 Pour batter onto hot iron and cook until they stop steaming (or until your waffle iron indicator alerts you).